While lamenting the fact that it is impossible for my March Madness team, now in second, to gain any additional points I failed to notice that the Boston Bruins have launched one of the most aggressive aggregation sites for social and traditional media concerning the team. The Bruins, winner of the last Stanley Cup, have launched the Bruins Digital Entertainment Network (DEN), a site that combines television, ticket info, with a wide range of social media contacts and sources. The site promises that it will provide not only what fans have come to expect in terms of data on players and games but it also said that it will be creating original content for fans to view. You can follow the team in a variety of manners including via BostonBruinsTV.com, at its popular web site BostonBruins.com or on Facebook. The list goes on with support at Twitter, Google +, Tumblr, as well as Facebook and Foursquare check-ins. An example of that is when the site says that its partners will benefit from its enhanced social analytics capabilities, courtesy of startup Umbel. 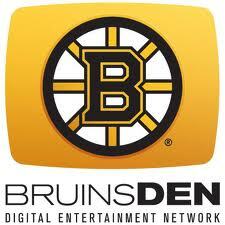 It has an app for fans called the Official Boston Bruins Mobile App (Bruinsmobile.com) powered by AT&T. The app already features a sitcom series called ‘The Bear and the Gang’ that centers on the teams mascot. The bear also has his own Pinterest page. The site is easy to navigate and all of the social media connections are clearly marked and easy to find. There is the almost obligatory Twitter feed, pictures from other fans posted using Instagram, and a hsot of additional connections ranging from one that gives you the all-time player roster to one that has a list of giveaways and events. The organization is moving to provide fans access to its team in a great number of ways, and allowing them to show their pride and interest in the team. Regardless if you download and use the mobile app, post images on Instagram, comments of Facebook or check-in the Bruins are putting the fan experience first. At the same time the business side is carefully intertwined with the effort so that the team can monetize itself and its partners’ efforts in this endeavor. About a decade ago just a few baseball teams had an Internet presence but MLB quickly learned what a tool the Internet was and pushed all of its teams online, and has since been very aggressive with all forms of social media. I hope that the NHL takes a page from that book and uses this as a template for the other teams in the league because I believe that fans will greatly embrace this opportunity.